In 1914, Deering enlisted 1,000 workers to bring his dream home to life. He and his artistic director Paul Chalfin traveled through Europe in search of the finest furnishings, antiques and paintings. The duo imported gilded panels, carved mantels and fresco ceilings from Tuscany and France to line the villa walls. It took years to perfect the mansion’s countless rooms, 34 of which overflow with treasures dating back to the 15thcentury. As you enter the Enclosed Loggia, you’ll notice sleek marble floors, reflecting a rainbow of light, beaming through stained glass doors. Step into the Breakfast Room and marvel at the motif, designed to represent the exchange of ideas during the “Age of Exploration” by combining Chinese ceramics with Neapolitan seascapes. Finally, as you make your way into the Cathay Room, you’ll get a taste of the lavish accommodations enjoyed by movie star moguls like Lillian Gish during her visit in 1917. But any trip to Vizcaya would be incomplete without a tour of its Edenic grounds. The greatest of photographs cannot convey the serenity of Vizcaya’s 10 acres of gardens. In many ways, the Formal Gardens resemble the layout of France’s Versailles. Low, trimmed shrubs organize walkways into mesmerizing, geometric patterns. Thick columns, lush mazes and classical statues also lend to its European aesthetic; but Vizcaya uniquely embraces its tropical surroundings as well. Here, palms, rare orchids and Cuban limestone infuse the palatial Mediterranean vibe with a signature Miami flair. The sprawling Formal Gardens were designed to feel like a great outdoor room, connecting to the main house along a North-South axis. A massive topiary-lined corridor gives way to The Mound, where The Casino provides stunning views of the gardens. East of The Mound lies the Fountain Garden, its centerpiece originally imported from Sutri, Italy. Another must see is The David A. Klein Orchidarium, where the museums houses a varied collection of orchids that, although difficult to grow in Deering’s time, now thrive and delight visitors. Located in the Coconut Grove neighborhood, Vizcaya has always been a cultural hub. Deering chose the Grove as the site of his winter retreat in order to preserve the natural habitat for future generations. After Deering’s passing, surviving family donated much of the property to the county, leading to its renaming as Vizcaya Museum & Gardens. The Discover Vizcaya audio tour is an educational way to learn about Vizcaya’s history and native vegetation. The museum now offers a series of monthly Family Programs, covering a wide range of topics, that are open and free to the public with museum admission. 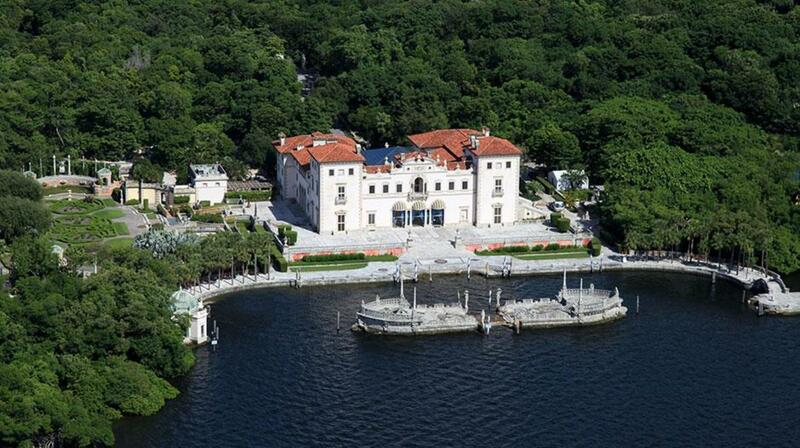 From Popes to pop stars, Vizcaya Museum & Gardens has played host to countless celebrities and dignitaries. It’s still one of the most sought-after locations for photo shoots, weddings and coming-of-age celebrations. With customizable tour options and affordable ticket prices, there are plenty of ways to become part of Vizcaya’s legacy. The property is open Wednesday through Monday from 9:30 AM to 4:30 PM. It is closed on Tuesdays, Christmas and Thanksgiving. For more information and to purchase your tickets online, head to vizcaya.org.